Zethr is a smart contract on the Ethereum blockchain. It is maybe the most developed and most advanced smart contract ever, with a real business use case, a casino on the blockchain. In this casino you are the owner, as soon as you hold the ZTH token. When you buy or sell the ZTH you pay a fee that is a % from 2% to 33%, you decide. If you choose the 2% fee then you will in return get 2% of other peoples buys and sells. If you choose the 33% then you will get 33% of other peoples buys and sells. Its the dividend model that came with P3D, just with the further innovation that you can choose your div%. How is it a business? When you hold the ZTH tokens, you get dividends every-time people buy or sell the tokens (the % accordingly to at which % you bought) and you get profits from when people gamble in the casino. Every Saturday the profits from the latest week of gambling is paid out to the token holders. That is why we call Saturday for Zethrday. What is beautiful about this casino, is that it is 100% on the blockchain. Since Zethr is in an ETH smart contract, then there are no people involved in the money transactions and the games are provable fair. People that understand what blockchain is and what a smart contract is will understand how genius of a business Zethr is. Imagine that there are no risk of a manager to corruptly not pay you your profits, this risk is literally in all of kinds of business's, where you will need to trust, the lawyer, the banker, the accountant, the dealers and so on. With Zethr, you only have to trust the code and other people have tested that for you and proven to you with their money that they trust the code. "Once you have 100 ZTH tokens, you can view your masternode at the top of the Exchange page. When someone else buys in after having clicked on your masternode link, YOU will receive 25% of the dividends that they pay." Is this a scam like Bitconnect? Unlike Bitconnect, Zethr is 100% on the blockchain, so no Zethr is not a scam like Bitconnect. On the other hand I think there is a relatively small possibility that Zethr will get hyped a little like Bitconnect, since it has a refferal program and people therefore have an incentive to promote it in all kinds of ways. Unlike Bitconnect, the profits on Zethr are slower as it is a real business and not a ponzi scheme, like Bitconnect was. Zethr is a real oppotunity to be a business owner and to be a promoter, where you will be rewarded when people buy the business's products (real provable fair casino games) and ones you have done a sale (of ZTH tokens so that other people become a casino owner too). Conclusion: Not a punzi scam but a real business on the blockchain, that anyone can enter, no matter their capital available, location and so on. Slots and dice is well-known games, whereas the ZETHR developers have made two new games, one called Cards and one called Hell. Those games are explained on the website, they make complete sense to me and especially Cards are proving the validity of this casino platform, since the prices for those cards are very high. To me this proves that this platform is not a joke. What can I expect will happen with the price of Zethr and the amount of ETH in the contract? Zethr has only existed roughly 2 months and there are about 5700 ETH in the contract. If we compare with P3D that has 38000 ETH in the contract, then Zethr is only about 16% of P3D in terms of ETH in contract. Some people say that because of the price of ETH is going down, then ETH smart contract games are not popular anymore, I do think that this is not necessarily true. The price of ETH going down is affecting Zethr negatively but because it is a finished product with continuing developments, I do think the amount of ETH in the Zethr contract will go up at one point. For sure the EOS blockchain is the best smart contract blockchain in existence, but still Zethr is a real business working right now. There is nothing like Zethr on the EOS blockchain as of today. To speculate on how much ETH will come into the Zethr contract is hard, but I could easily see at-least a 10x up from now at one point. I absolutely love zethr. Bought into this platform when contract was around 500 eth and haven't looked back. The dice and slot game are legit and the divs are awesome! 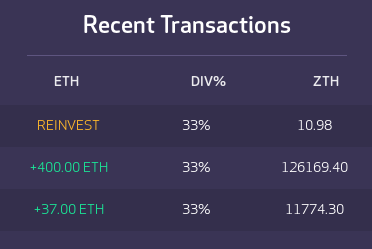 I would recommend that if you're buying in, choose the 33% div option as the coin value doesn't increase as much as p3d for example so the majority of what you will make is based on divies. Great Post! You got in very early, you are smart or lucky. Its still early for Zethr. Lucky for sure and yes, we are all still very early. Zethr wants to make a full casino with many more games. Get in now while you can for a decent price! This post has received a 25.56 % upvote from @boomerang. Lets hope it happens, ETH will not go away before the EOS dapps mature, it will take years, I believe, am I wrong? Sounds good. Would u need any license for it? This is crypto, you don't need a license, that's the whole point. Permission-less finance. This post has received a 17.95 % upvote from @boomerang. People get scammed by Bitconnect and are very cautious with its next thing similar to it. Bitconnect (BCC) is a coin, but the lending platform was just a centralized website, not on the blockchain. With Bethehouse.online (ZETHR) it is different, Zethr is 100% on the blockchain, no people involved in the money transactions, so no way to get scammed. Of course you will need to trust the code and that not everyone sells. Sounds great. According to me it's a perfect example of innovation. looking forward to try this. hope it'll work. Everything in Bethehouse.online (ZETHR) is working, I been testing it for more then a month. okay, I'll definitely try this and I need a bit help from you I am new at steemit and struggling little bit so it'll be great if you follow me and upvote my post if you feel free to do that and it means a lot. 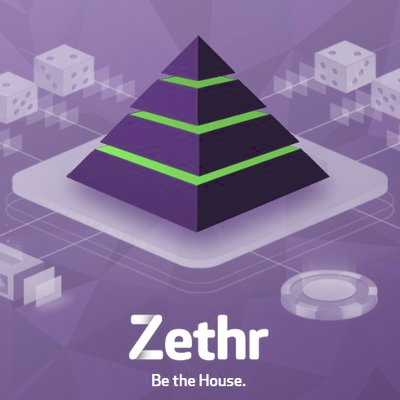 Sure, all you need is ETH and metaMask, then you can buy the ZTH via the exchange on Bethehouse.online (ZETHR) . Do you recommend Brave, Opera, Chrome, etc for Mac users, when using Metamask? I'm upvoted, Grow up together.!! This post has received a 71.75 % upvote from @boomerang. Thinking about investing in bitcoin. Bitcoin is like the grandfather of crypto currency. If you want more upto date investments, then I suggest something like Bethehouse.online (ZETHR) . You got a 37.52% upvote from @postpromoter courtesy of @kryptosignaler! You got a 73.89% upvote from @upmewhale courtesy of @kryptosignaler! You got a 60.21% upvote from @upme thanks to @kryptosignaler! Send at least 3 SBD or 3 STEEM to get upvote for next round. Delegate STEEM POWER and start earning 100% from your share, daily payouts ( no commission ). I am a promoter of the project, since I been blogging about crypto currency for 2 years on my personal blog @lasseehlers . I do think there will come more games over time and it could happen fast. The slots came just a few weeks ago. There is a discord chat, wechat and so on with more information if you want to know the details. "That sounds like a scam!" 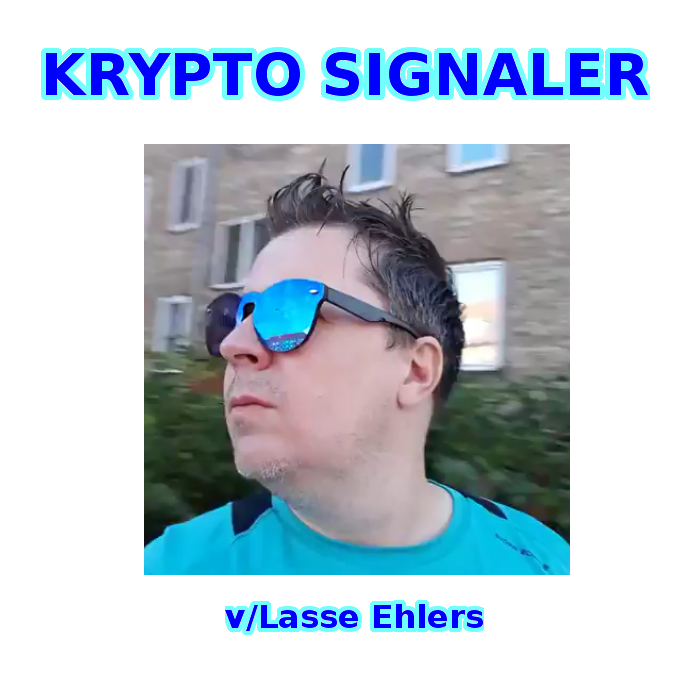 @kryptosignaler at first, thank you for this post. I am just looking forward to searching for this type of information. Thanks again for gathering these valuable information for us. Hi pro, can you tell me how to earn STEEM DOLLARS? @kryptosignaler purchased a 92.66% vote from @promobot on this post. 5.2 JURISDICTIONS. Persons located in or residents of the United Kingdom, the United States, the United States Territories and Australia (the “Prohibited Jurisdictions”) are not permitted to make use of the Service. Handing your crypto to another person, involves trust and risk. Investing in a smart contract, is trust-less, but yes the price could go down. 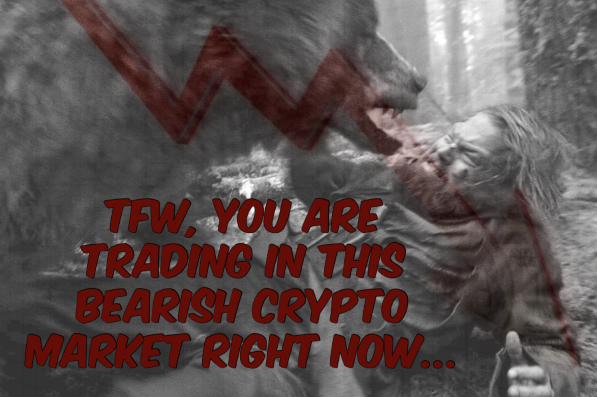 If I should give an advise right now on where to put your crypto? I would say a combination of SBD and STEEM/Bethehouse.online (ZETHR). Sounds good. But here I have a question.. would you need licence for this..? I also like to the zethr. which things we can sell and buy on zether token? Great, i will review this wonderful opportunity and invest into this project. This is a very nice project.A new road to investment.I like it very much.thank you. I think this is nice. I love zethr.